OK. Yes, we know. Even so, there’s just something about Houdini the man and the myth. And being a fan is no longer about becoming Houdini (though for some it once was). Nor is it about defending Houdini. (Well, maybe a bit.) It’s about appreciating two interwoven themes in the life of Ehrich Weiss: a tragically imperfect pursuit of the American Dream and a splendidly perfect example of magical theatrics. The actor lived a life, not always well, but the character he played projected a fiction, always magnificent. When winter reigns, bestow a benediction. And given essence by Thy blessed Word. in the winter of 1991. This poem is part one of two. Here's the follow-on poem. This is a relatively self-indulgent post, but hey– blog! I was once, and remain, a rabid fan of the gaming franchise that began with Thief: The Dark Project, continued with Thief II: The Metal Age and Thief: Deadly Shadows, and will soon resume with 2014's Thief. These are the high water mark in first-person, hybrid, potentially non-violent, stealth-based, story-rich games. A recent discussion of satire, parody, and pastiche in the comment section of another thread here reminded me that I wrote a handful of Thief-themed pastiches back in the early aughties. To share them with others who might like them, to store them in our database, and to revisit them with wistful nostalgia, I reproduce them below. Each is set to the theme of a pop song. Note well: these are only meaningful if you've played the games, and they're best read with the corresponding tunes playing in the background. 🙂 The songs are Barbie Girl, All Star, Mickey, We Didn't Start The Fire, Uptown Girl, Cheers, and U Can't Touch This. In one sense, the message of this post in a nutshell is "Ain't I a clever chap!" But if you, too, love the Thief games, then in joining the nostalgia perhaps you'll revisit some fond memories of your own. Marian Call with retro cell phone. Photo by Scott Adams. For my previous coverage of Marian Call, click this tag. If you're unaware of her, start here. Not long ago, I took a little trip to Silver Spring to see Marian Call in her natural habitat– the house concert. The venue was the smallish common room of a co-op apartment house. Some had brought beer or wine. Others pizza and sweet shortbread cube thingies. Some came in groups, some in pairs, some alone. The room was decorated in the inconsistent, individual way that you might expect. On one wall hung a crazy quilt. On another, a painting of ethnic women, laborers, chopping logs and hauling bundles of wood. On a third wall, drawings apparently made by children residing in the co-op. On the fourth, schematics for the layout of the communal gardens and shrubbery. From the ceiling sagged sound dampers, billowing sails of a sideways schooner. At one end of the oblong space, amps and equipment littered a makeshift stage. Subject was first spotted in the vicinity of the sweet shortbread cube thingies. Eventually grokking this part of the local customs, I sidled up to the buffet counter and introduced myself. Marian Call is a person of average height and decidedly Tigger-like demeanor. Awash in pre-show adrenaline, she bounced rapidly on her heels with endearing enthusiasm and declaimed rapidly on a variety of topics. She spoke of her admiration for the US Postal Service (for this concert was a part of the now-finished Postcard Tour, a format described below). She explained that the only part of the Smithsonian Institution that she had had the opportunity to enjoy (apart from a brief detour to see the Apollo lunar module) was the National Museum of the American Indian (she has a more-than-casual interest in first nation history and issues), where she only had time to enjoy the quasi-native food before rushing off to realize some larger purpose. She spoke of Prague as symbolic of the tourism she may someday have the chance to enjoy; it was the one point (other than CERN!) in her European tour where she had had a couple of days (still not really enough time) to catch her breath and absorb broader overlapping contexts. She emphasized that touring, even in Europe, is not like a vacation; it's her job, and it seems like a job since it consists mostly of preparing to perform, performing, recovering from performing, travelling, and tending to the business and communications that make her endeavor sustainable. I found myself a silent choir of one as she sang the praises of procrastination ("It helps me get things done!") and sleep ("No more all-nighters!"). She very kindly mentioned that my essay about her lyrics gave her a morale boost when one was needed. All of this took not more than five minutes, and then it was showtime. She opened with the karaoke song, performing it with hilarious exaggeration to the delight of her crowd, which numbered 40 or 50. After another crowd-pleasing participatory number, she sang a few of her newer works, some commissioned and others spontaneous and irrepressible in origin. One of these, featuring the line "There's the paper and the pen and me; the storm stole the electricity," offered an unplanned magical moment. Since well before the show, half the building had been without light because of a power failure, and even the meeting hall was still semi-dark. But just as Marian sang that line, the power suddenly returned. The audience mumbled its wonder, but Marian maintained composure. After the song, she quipped, "I'll be taking this song on the road to restore critical infrastructure across the land." The first set of seven ended with one of my favorites, Got To Fly, and then came the intermission. This was a time to buy wares, of course, but also a time for creativity. This show was part of Marian Call's Postcard Tour, which entailed having people at one show make postcards for Marian to carry to people at the next show, and so on. "Strangers with similar interests"– that's the head of the nail, right there, Alicia. Well done. After the postcard frenzy, Marian's sideman, Scott Barkan, offered an intermezzo. 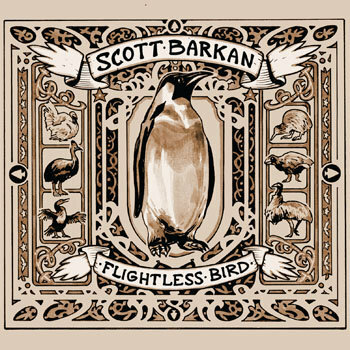 His own album, Flightless Bird, is available at Bandcamp, and is noteworthy not only for its magnificent cover art by Benjamin Dewey of Portland, but also for Scott's heartfelt, pessimistic, and strangely vulnerable lyrics. He treated us to three songs: Break it to Me Hard, Flightless Bird, and Bad Dreams. What struck me most about his blend of TomWaitsian vocals and TommyEmmanuelesque fingerstyle guitarmanship (which threw his instrument out of tune after every song, but for a good cause!) was the paradoxical precision with which he executed works that are constructed to seem rough and raw. Scott's informal self-presentation lends itself to the notion that he must spend every waking, offstage hour developing the technical musicianship that enables him to pull off that sort of performance– and, for that matter, to deftly support some of the musical challenges Marian Call sometimes folds into her own compositions. Here's a representative sample of Scott Barkan, from his performance at CERN. If you like what he provides, I encourage you to buy his album! In any case, Scott's a humble guy and didn't seem to mind ceding the stage to Marian, who resumed her station and dealt us another great set. Afterward, I deferentially nudged my way past a particularly enthusiastic, comicbookish groupie who seemed to have a lot on his mind, and I enjoyed another brief, awkward chat, wherein I praised Marian's appreciation of the analog and she showed me a photo of her former not-so-smart phone, a cousin of the one I still use. She describes it as "A new record of intimate songs from the road, on love, lightning, time, and hope. Small and focused in scope, deep like diving." She gave us a sneak preview of some of these songs at the concert, and they're lyrically rich musical morsels of the kind and caliber we've come to expect from this bouncy, brainy, optimistically brooding artist. To celebrate this auspicious occasion, I'd like to give away three digital download codes for Sketchbook, which will be released tomorrowish, or thereabouts. Our last Marian Call giveaway depended on being first in line, but I'd like to do things differently this time. So I'll gather all requests first, and then I'll discover the winners among them by using random.org. (If you've previously won a giveaway here, I'd ask you refrain and let others vie.) To submit your request for one of the three download codes, you may either tweet me at dcbyron with the hashtag MCSketchbook xor email the word MCSketchbook to me at david at popehat.com. (Don't do both!) It's about 3:00pm EST. I'll collect these until 3:00pm EST tomorrow (01 Dec), and then notify the winners. It seems Hasan Niyazi, the tireless blogger, talented amateur art historian, and independent Renaissance scholar behind the popular art history blog Three Pipe Problem and the ambitious Open Raphael project, has died suddenly at 37, the same tender age as his idol, Raphael. I first interacted with Hasan in 2010, and we discussed things by email now and again over the years. A man of science by training, he harbored endless enthusiasm for evidence-based scholarship in art history, for the importance of the Digital Humanities movement, and for free and open educational content– values we shared. If you're so inclined, take a moment to look at his websites, which now stand as monuments to his energy, focus, idealism, passion for beauty, and love of learning. Edit: See also the moving tributes by Prof. Ben Harvey, Prof. Monica Bowen, and Dr. Francis DeStefano. Above all, Hasan promoted community, encouraged cooperation, and took delight in sharing the discoveries and insights of one and all. In some measure, the art historical blogosphere itself is his handiwork. Edit edit: See also the interesting remembrances by Jenna Francisco, Alexandra Korey, and David Packwood. And hoping to model their nest. And feel that old Al does it best. We've worked hard to effect their premoval. I once took a gander at some lovely gal. But that brow ridge! It made me her pal. If you'll join me now down in the valley." And we down toward the river did sally. And maybe a tango or two. 'bout the chromosomes that she left to you.